Win a chance to attend a South Sydney Rabbitohs home match and gain a behind-the-scenes understanding of maths in sport. To be eligible students must participate in The South Sydney STEM Cup (access here), an online maths challenge based on the real-world career of the South Sydney’s Football Club’s Capologist, Peter Legg. Students register & explore The South Sydney STEM Cup (access here) and then run the Capologist Field Trip before 25 May, 2018. Students select their “dream roster” for the 2018 season by assigning player salaries based on 2017 performance statistics. Goal: Select the best Rabbitohs team roster while keeping the team’s total salaries under the National Rugby League salary cap. Results compared automatically to those of the real South Sydney Football Club Capologist, Peter Legg. Top Students and the top School win the South Sydney STEM Cup Match Experience. 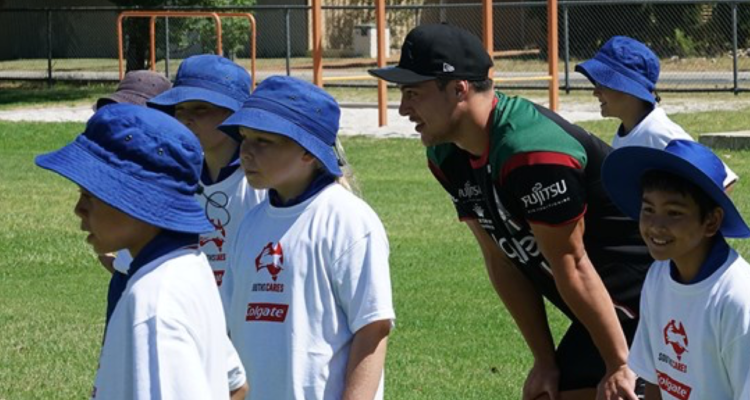 Students will be recognised at half-time of their achievement by Rabbitohs and AAMT. The South Sydney STEM Cup is supported by the Australian Association of Mathematics Teachers (AAMT).